It was a good job that the Division 1 promoters voted to keep the guest rider system at their conference since the Division 2 promoters decided not to use guests at all. It would have been difficult for the Heathens to complete their fixtures! They had so many injuries during this season as well as losing Erik Gundersen the year before it must be something of a record, using no fewer than 51 guests during the season. Jan O Pedersen, Simon Cross, Gert Handberg and Greg Hancock were retained from 1989. Billy Hamill was signed to replace Erik Gundersen, Alan Grahame eventually signed his contract (was it ever in any doubt?). The only other change was at reserve, John Bostin, was the rider to go to get the points average down. It was decided to give the reserve berth to the best of the junior riders on press and practice day, it went to 22 year old Mark Robinson - Robbo as he soon became known. Erik's involvement with the club continued as his health continued to improve following his terrible accident from the year before. On bike - Simon Cross. to Lance being unable to secure a BL place. It was also good rehabilitation for Erik to help his recovery and his workshop facilities were invaluable to the two young lads. To this day they are so appreciative of the mentor they had to carry them both to the top of the speedway world. Everyone was looking to Billy the Bullet Hamill to follow in the footsteps of his predecessors Bruce Penhall, Bobby Schwartz, Lance King and indeed Greg Hancock, he did not disappoint, typical American lad ready to learn, very confident and very likeable. Despite this it took time for Hancock and Hamill to settle down in the UK. It was not long before the troubles began, Gert Handberg was injured in practice and missed two matches with a hand injury. Colin elected to use Rider Replacement for Gert against Bradford on 24th March and were beaten by the Dukes 49-41. Next it was Robbo who got hurt crashing into Shawn Moran and damaging his shoulder, missing two matches. Simon Cross and Jan O during this time were phenomenal both riding in Test matches for their respective countries. Pedersen was at his best winning the Gold Bar meeting in Denmark in one the most spectacular speedway meetings ever seen on camera coming from last place to first in an eight man eight lap Final. Then winning the Danish Final and breaking the Holsted track record twice. Then the troubles came,Simon was partner to Kelvin Tatum in the World Pairs when he crashed in the six man races breaking two vertibrae and putting him out of action for 18 months. This was soon followed by Jan O getting injured in a freak accident go-kart racing and breaking his arm. These injuries wrecked the Heathens chances of winning anything for the remainder of the season. It was particularly devastating to go out of the KO Cup which we had won for so many years. (G)Peter Nahlin 5, Alan Grahame 0, David Haynes 0. Bradford beat Swindon in the Semi-Final ..
Cradley started the season by winning the Premiership against Oxford 95-85 on aggregate. We hosted a World Championship British Semi-Final and Gary Havelock was the winner. Alan Grahame Mark Robinson 2. 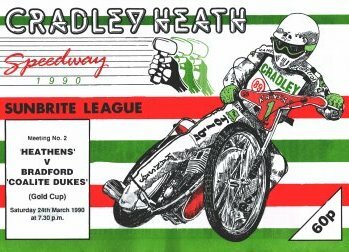 Copyright: Steve Johnson & Cradley Heath Speedway Ltd. 2013.